Published Apr 1, 2014 by VMware Press. Part of the VMware Press Certification series. The VCP5-DCV Official Cert Training for Exam VCP550 is for anyone who wants to get the delta of information from the previous VCP510 exam in order to procure the VCP-DCV Certification. At VMworld 2013 VMware announced vSphere 5.5, the latest release of VMware’s industry-leading virtualization platform. No trivial update, this release included a lot of improvements and many new features and capabilities. Covering the official blueprint, bestselling author and VCI (VMware Certified Trainer) Bill Ferguson is ready to get you up-to-speed on the changes made in vSphere 5.5. 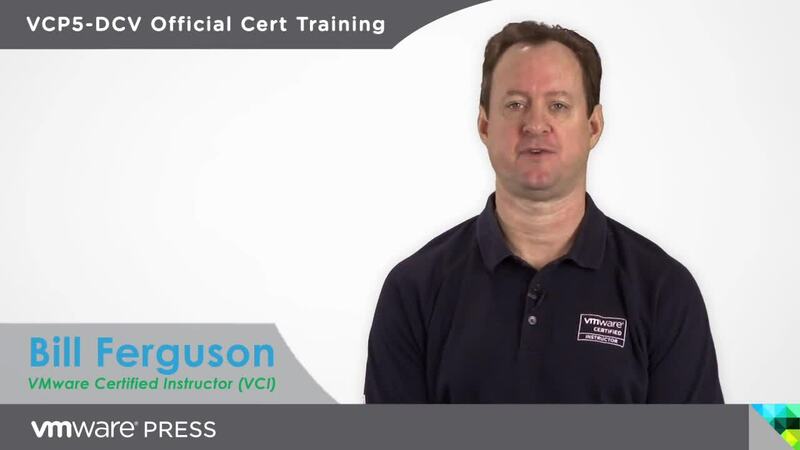 For a thorough and complete VCP5 certification self-study program, covering all new content as well as foundation topics, combine this VCP5-DCV Official Cert Training with The Official VCP5 Certification Guide (VMware Press). LiveLessons Video Training series publishes hundreds of hands-on, expert-led video tutorials covering a wide selection of technology topics designed to teach you the skills you need to succeed. This professional and personal technology video series features world-leading author instructors published by your trusted technology brands: Addison-Wesley, Cisco Press, VMware Press, IBM Press, Pearson IT Certification, Prentice Hall, Sams, and Que. Topics include: IT Certification, Programming, Web Development, Mobile Development, Home & Office Technologies, Business & Management, and more. View All LiveLessons http://moko-kurzhaar.ru/?page=imprint/series_detail.aspx?ser=2185116.